In the North-West of Argentina, there’s a tiny, remote province called Jujuy. It’s set against dramatic red mountains and known for its picturesque Quechuan villages. But there’s something else that makes it stand out: Jujuy’s inhabitants are more likely to have microtia than anywhere else in the world. And one ENT doctor is determined to bring hearing to those children affected by it. Microtia is a congenital defect where your ear does not form correctly. It can affect both the outer part of your ear, and your ear canal. Because of this, sound can’t reach your middle and inner ear as easily, causing conductive hearing loss. In most places, around one or two babies in every 10,000 are born with microtia. In Jujuy, it’s more like 20 babies in every 10,000. 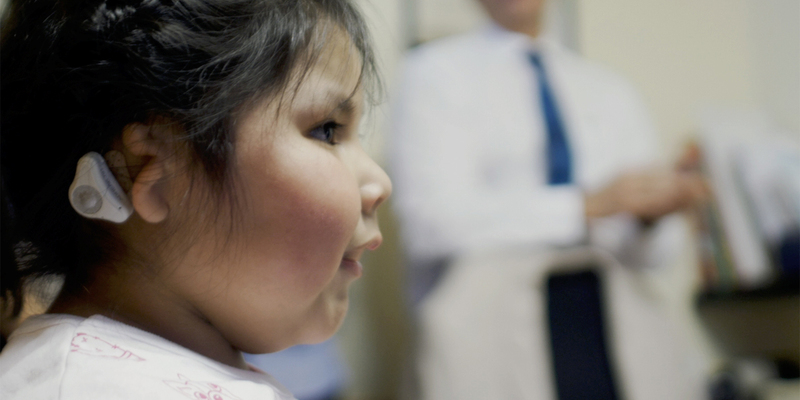 Dr Mario Zernotti, an ENT doctor from Cordoba in Argentina, decided to help by spearheading a new project to help the children of Jujuy with their microtia. He decided to give them bone conduction hearing aids and see how this would improve both their hearing, and their lives in general. Choosing the right device was important. Most non-surgical bone conduction hearing aids are attached to a headband or softband. As the device vibrates, these sound vibrations are transmitted to skull bones, and on to the cochlea in the inner ear. This allows you to hear, but the pressure applied to your skin can be a bit much, especially for children. But the new ADHEAR system doesn’t have this problem. You simply stick ADHEAR behind your ear using an adhesive adapter, and it vibrates your bones without applying any painful pressure to your skin. For Dr Zernotti, it was the ideal solution. And, along with a team of MED-EL engineers, he travelled to Jujuy to meet the kids involved and show them their new ADHEAR devices. For many of the children involved in the Jujuy project, this was the first bone conduction hearing aid they had ever tried. Jujuy is one of the poorer regions of Argentina, and parents often have to fight to get the help their children need. This is certainly the case for the Ramirez family. Six-year-old Santino was born with microtia and Goldenhar disease, making it difficult for him to hear on one side. But for mom Esther, there was nothing she would stop at to get her son the help he needs. Santino doesn’t normally hear with his right ear. “It was very exciting to observe when the doctor spoke to him and he turned to the right side.” With ADHEAR, Santino can hear which direction the sound is coming from, whether it’s his friends in the playground or a car on the street. And Santino was not alone in enjoying his new bone conduction device. Overall, 15 children from Jujuy received an ADHEAR. “Activating the devices was a very emotional experience,” explained Humberto Maone from MED-EL Latin America. And there’s more good news for the ADHEAR recipients: Jujuy’s minister for health has pledged to help provide adhesive adapters and batteries, along with support to keep their ADHEARs in good working order. With help like this, these children can finally have the childhood their parents dreamed of. Discover how ADHEAR changed the life of young William in the UK. Want to find out where ADHEAR is available near you? Check out our Clinic Finder. Learn more about bone conduction, and how it shapes the world around us.